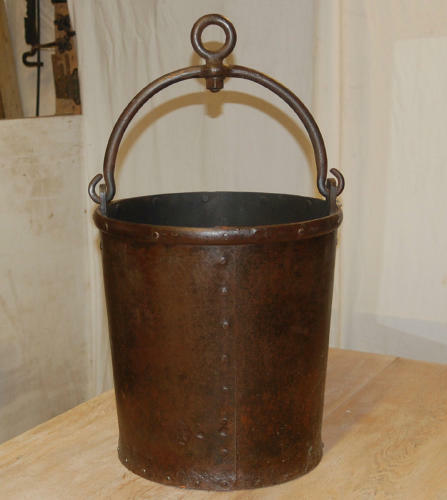 A large, metal, Victorian blacksmiths forge bucket, perfect for use as a log basket. The bucket has a large, solid, handle with top hanging loop and the handle moves freely. Please note the handle loop has had a nail inserted in to it to keep the handle static for photographic purposes and will be removed for sale. The basket has a wonderful tarnished look with character patina and a rivited side. The bucket has been laquered to prevent further rust and achieve a fantastic finish. The basket would be ideal for use within a hearth, as a log basket or for holding fire tools. The bucket has a great antique look, and the tarnish gives a rustic, country feel to the item. The bucket is in great, antique, condition but has some signs of wear, illustrating the items age. There are some knocks, marks, scratches, surface rust and signs of use. There are some chips and erosion to the edges where the bucket has been rivited and there is some surface rust. The inside has some light rust and wear. The band around the top is slightly eroded. A fantastic decorative item that has versatility and great upcycling potential.